Search is a great way to review your transaction history, and it just got even better. Now, you can search pending payments and discover who still owes you lunch money! This is really convenient when you are collecting money from a group of friends. Just use an easy to remember tag in your payment note, like skitrip or #fantasyfootball, and you can quickly see who has paid and who still owes you. Checkout what we have been working on at Venmo! Ted just gave a nice UI refresh to our Android App. Download it today if you’re on Android and let us know what you think! We added a useful little SMS feature over the weekend that helps you find more info about someone before sending a payment: the About Command. Enjoy the new feature and the lovely springtime weather! * Pro tip: try using “About 646” to get information about any area code! Typographical and grammatical errors in correspondence are a great way to tell a recipient that you did not spend much effort or time composing your message. I have been keen to eliminate these errors from any emails, chats, blog posts, or even text messages that I write, and as a way to help enforce this habit I now include in my email signature a link to invoice me if you catch me making a mistake. Just enter your Venmo username, an amount you would like to be charged, and a note explaining that you are rewarding anyone who catches you making a mistake. Payment links are pretty flexible—instead of making a link that prompts someone to charge you, you could also make a link asking someone to pay you for something cool you wrote or a service you provided them. We’ll write up some more interesting and detailed examples of payment and invoice links soon, so stay tuned. Also, let us know if you create a cool payment or invoice link of your own! We have raised $506 so far, just by asking a few of our friends to help out. Donate on the web to /VenmoCares UNICEF donations. We want to raise as much more as possible, so please ask all your friends do donate and let them know they can help just by sending a text message. 100% of donations are going to UNICEF. Please help! We’ve been working hard at listening to your feedback and adding new features that make Venmo easier to use. Rejoice— we’re getting closer to being able to completely eliminate cash from our lives. Alert preferences- In your account settings, you can now control how often you receive notifications from Venmo— weekly transaction summaries, payment notifications, and Fav notifications. Invite your friends- You can now invite up to 10 friends to Venmo. Give the gift of Venmo to people who you frequently exchange money with— roommates, friends, and family members! Tweet your payments- Connect to Twitter, and post your Venmo payments automatically to Twitter by adding “#tw” at the end of each message you send to Venmo. Use our Twitter Connect to share payments, invoice your friends who owe you money, and share items you’re selling with your friends! Fav spell check- We all make typos (yes, even this guy). If you try to make a payment on Venmo to one of your fav’s, and accidentally type in the wrong name, we’ll make sure you had the correct user. As always, we’d love to hear your feedback and comments. Think of a killer feature we need to add? Let us know! Talk to us at our support forum, on Twitter, Facebook, or just leave us a comment below. If you’re like us, you probably live in your Gmail inbox. Read on to learn how to set up a filter to automatically label and archive all Venmo receipts, so you can easily organize and keep track of all your transactions, all from within Gmail! 1. 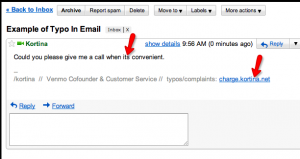 Go to Gmail settings. 2. Go to the “Filters” tab, and click “Create a new filter”. 3. Under the search criteria, enter “Venmo receipt” in the “Has the words” field. If you want, you can do a test search to see all your Venmo transactions highlighted in the search. Select “Next Step”. 4. Select “Apply the label”, and create a new label with a title like “Venmo receipts”, or something similarly simple. Optionally, if you like to archive your inbox (why archive? ), you can choose to automatically archive all Venmo receipts by choosing the “Skip the inbox” option. That’s it! You’ve just set up a filter to automatically label and (optionally) archive all your receipts for Venmo transactions. 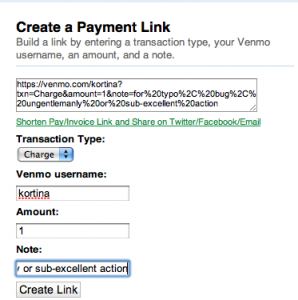 It’s the simplest way to keep track of your Venmo history if you’re a heavy Gmail user. A recent report released by the Taxi and Limousine Commission has revealed some interesting information about the link between credit cards and the health of the taxi industry. According to Matthew Daus, chairman of the Commission, speaking to the New York Times, “The credit card [reader] that we put in cabs has helped keep them afloat”. Riders paid with a credit card one out of every five trips (20%), compared with just 6% a year ago. While other similar service industries are reeling from the economic downturn, like the black car business, which is down 30% this year, the taxi industry is relatively stable. Data shows that they are maintaining consistent levels of business, with just about 400,000-450,000 cab rides a day. Part of the success can be attributed to black car clients choosing to ride in cabs instead, since the new credit card machines enable them to now charge their cab rides to their corporate cards. Despite the increase in tips, many drivers are fiercely resistant to the installation and use of credit card machines. It’s not uncommon to see drivers refuse to take passengers who want to pay by credit card, even if they already have a machine installed. On top of transaction fees, the machines are expensive and not easy to maintain, with malfunctions being costly and annoying. The NYTimes reports, “Beresford Simmons, a driver, testified that once his credit card machine malfunctioned, and the passenger gave him all of her cash — $7 — though the fare was $45, and said she did not want to drive around looking for an A.T.M.” Just as aggravating, drivers sometimes have to wait for weeks or even months to receive their reimbursements from credit card transactions. Venmo allows cab drivers to keep their customers happy and accept their preferred method of payment— credit cards, but to do so without the hassle of credit card machines. Venmo does not have expensive setup fees, and does not require bulky equipment that can be difficult and costly to maintain. Venmo allows the driver to receive payments directly to his own Venmo account, from where he can transfer funds to his bank account within 3-5 business days. Cab drivers and companies, make a smart long-term business decision and adopt Venmo today— accept credit card payments without the accompanying hassle!